14 The following ﬁgures relate to Jumbo Traders for the year ended 31.12.13. 16 List three levels of inﬂation. 20 The following information relates to Kahawa Traders as at 31st December 2012. 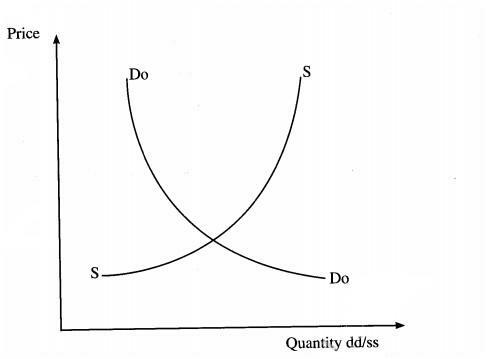 (b)The following information was extracted from the books of Mamboleo Traders in the month of September, 2014. September 1 - Had cash in hand, Shs15,500 and a bank overdraft of Shs 9,700. September 3 - Bought goods for sale Shs 12,300 on credit. September 5 - Sold good in cash Shs 8,500. September 9 - Sold goods on credit Shs 10,000. September 12 - Received a cheque of Shs 9,000 from a debtor. September 15 - Paid a creditor Shs 10,000 in cash. September 17 - Paid wages Shs 2,600 in cash. September 19 - Received a cheque Shs 23,400 from Samson for goods sold in January. September 20 - Received Shs 6,700 from a debtor in cash. September 23 - Withdrew Shs 7,700 from the bank for ofﬁce use. September 24 - Paid electricity bills by cheque Shsl ,200. September 25 - Received a cheque of Shs1l,50O from a debtor. September 26 - Made cash sales of Shsl2,800 . September 27 - Purchased goods worth Shs 8,950 in cash. September 28 - Deposited personal cash Shs 3,500 into the business account. September 30 - Paid water bills by cheque Shs 2,800. 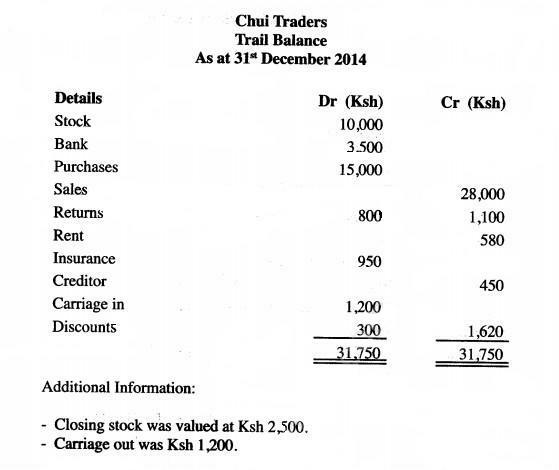 4 (a) The following trail balance relates to Chui Traders as - at 31st December, 2014.